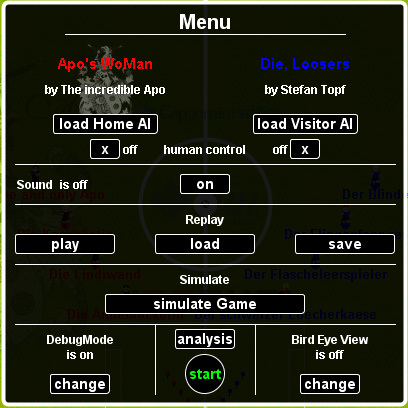 Apo-Soccer is a small soccer game inspired by Robo-Cup. Two teams of four players each are facing eachother and try to score a goal. Each team consists of one striker/rusher, one keeper and two defenders. The goal is to write an AI for a team. To assist you we develop an example player on this site. We will show how to address the player and how to move him. For any further question we provide you with help in our forums. Perhaps the shallowest reply ever, but... if you are targeting an international audience, please make the GUI English. The only thing that is in german is the "live-ticker". Now the sourcecode is in the jarfile, I removed some bugs, add new debug-features and some other improvements. the "setShoot(int angle,int speed)" what is the angle ? Absolute angle (I don't think so, it writen something like 0-150) ? Angle from the lineOfSight of the player ? Angle from the lineOfSight of the ball ? Angle from Player->Ball vector ? I have lots others questions (Images, hairs, ...) but it is the main question right now. One other things that is horrible is that I have to do the AI twice... one for the "left" and one for the "right". And last, when I open the directorys and I see soooooo many dll... I just feel to say "Bye bye mister Linux User", "Bye bye mister Mac user"
sorry you are right. Nearly all the java docs in the source are in german. Only some methods are explained in english. setShoot(angle, speed): The angle is absolute. The Speed must be between 0-150. If your freshness is low you can't shoot with full power. I don't think you have to write your AI really twice. You are right, you have to look where you are (left or right site) but the most methods I write arn't concerned. Most of my logic need to : am I in the right direction to shoot ? Is X behind/before Y ? So I have to change a lot of things for left side to right side. Well I have done a warper that translate the coordinates from right to left and now I don't have to deal with it. I have change the coordinates center too, I prefere when (0,0) is at the center of the field. There is only ".dll" no ".so", can Linux user test the C++ AI provided as is it ? I have download the "sound" version, beside the text to speech, there is not other sound ? If you put a sound when you shoot, there is a goal and a whistle at the begining/side change, the game will be far more lively. Last one (for today ), costum image can be used but it is an image for a team not an image by player ? 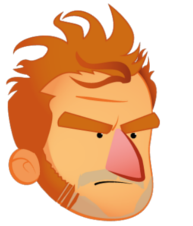 the public String getPlayerManImage() is the image for all men in your team. the public String getPlayerFemaleImage() is the image for all women in your team. It is more and more difficult to improve my team... and it is not a very good one Everytime I got a new idea to test, it do worst than before Well I have a few time left to manage something. Stupid question... how do I submit my team ? after that you are here. Then you have to fill it out (forename and surname, click the right radio button, an then your password and your e-mailadress). How many participant to the contest ? In the first one (the intern competition) are 21 participants. In the second one (the extern compoetition with your ai) there are 10 participants. Thats not so much ... but better than nothing. The final results you can see here. I congratulate all the winners and thank all the participants. congratulations for bonbon chan's third place in the external competition !